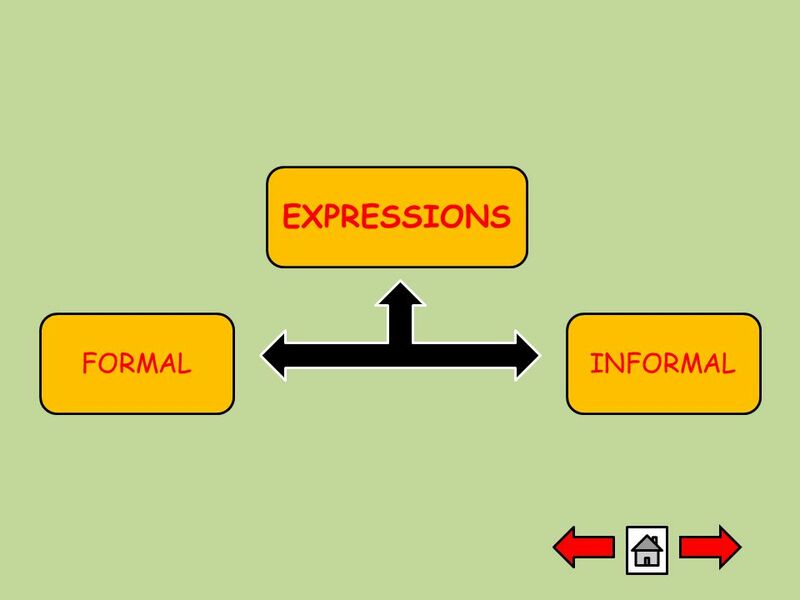 EXPRESSIONS DIALOGUE INFORMAL FORMAL JUDUL. Greeting. 4 GREETINGSLEAVE TAKINGS  Good morning.  Good afternoon.  Good evening.  Good night.  Goodbye.  Stay in touch.  It was nice to meet you.  I hope to see you seen. 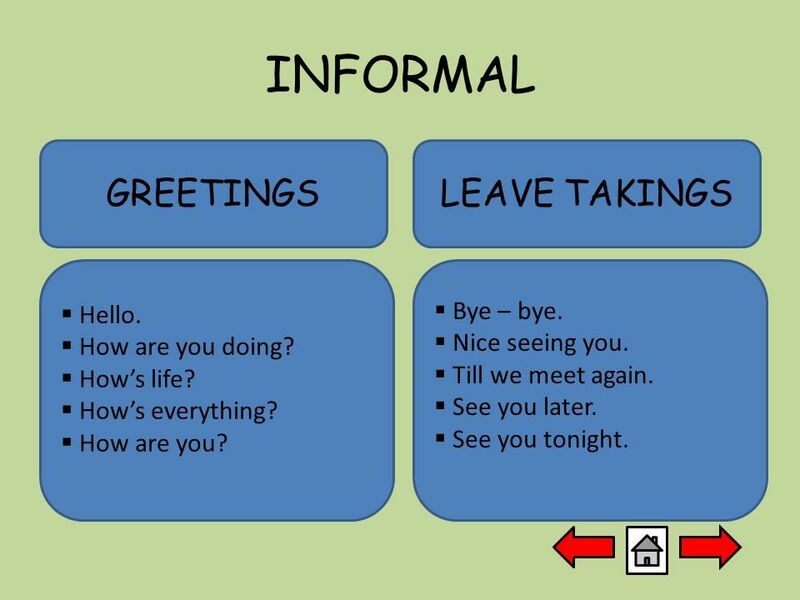 5 INFORMAL GREETINGSLEAVE TAKINGS  Hello.  How are you doing?  How’s life?  How’s everything?  How are you?  Bye – bye.  Nice seeing you.  Till we meet again.  See you later.  See you tonight. 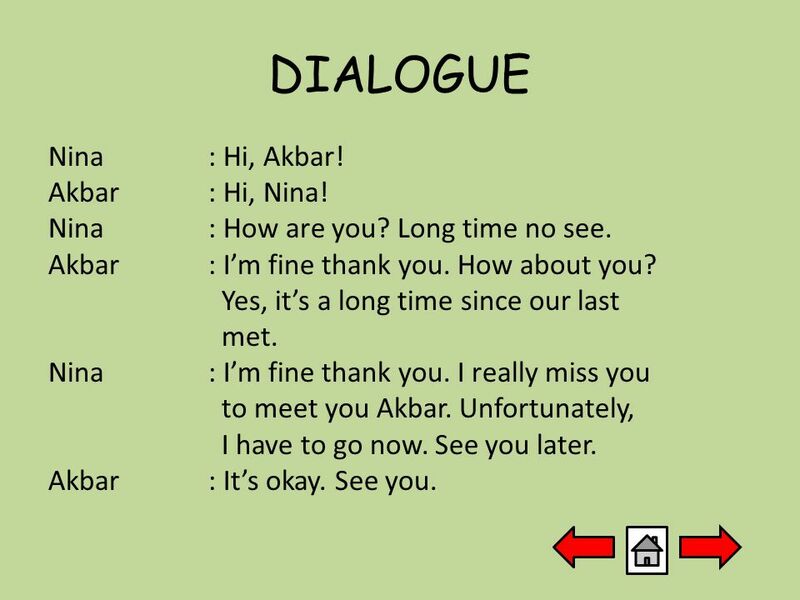 6 DIALOGUE Nina : Hi, Akbar! Akbar : Hi, Nina! Nina: How are you? Long time no see. Akbar: I’m fine thank you. How about you? Yes, it’s a long time since our last met. Nina: I’m fine thank you. I really miss you to meet you Akbar. Unfortunately, I have to go now. See you later. Akbar: It’s okay. See you. 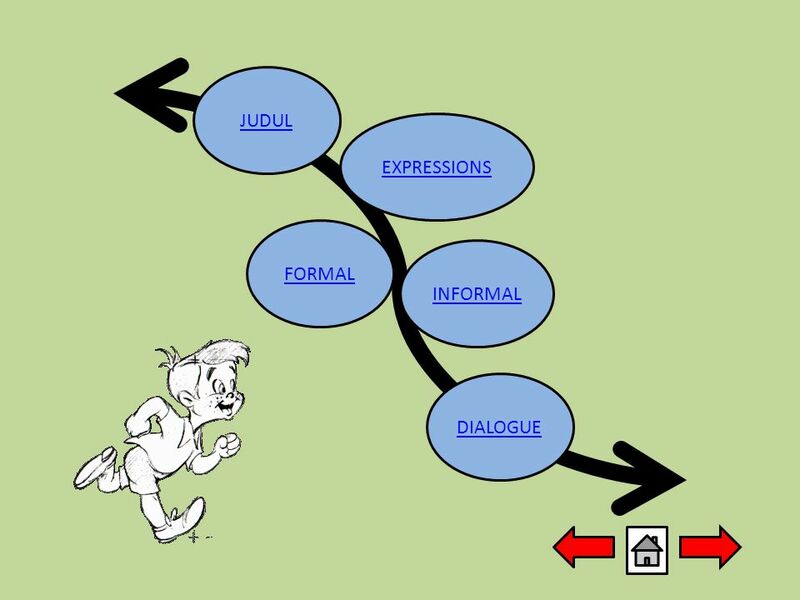 Download ppt "EXPRESSIONS DIALOGUE INFORMAL FORMAL JUDUL. Greeting." Unit One My name’s Gina. Period 1(1a-2c) Gushun School Miss Jin. Love At First Sight What a beautiful day it is today! You are as beautiful as this day is! Who said that!? It is I! Chuck! Hello there Chuck. My name. Flipchart 1: Greetings, Farewells, & Introductions. Spanish 1. Hello Hello. What is your name? My name is Ana, and your name is? My name is Carlos. turn right turn left intersection straight. SPU STAFF TRAINING Sripatum Institute of Language and Culture Lesson 1 – First Time Meetings and Introducing. WELCOME HI GOOD MORNING GOOD MORNING GOOD MORNING GOOD MORNING. LT-1: I CAN GREET PEOPLE AND SAY GOODBYE. 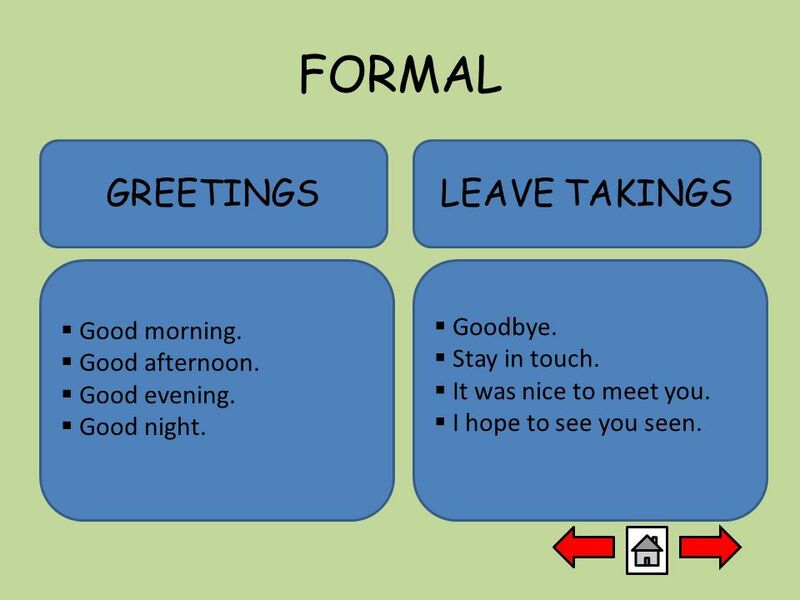 This means that I can say hello and goodbye in several different ways. I know how and when to use these expressions. SAYING HELLO AND GOODBYE A Greeting is a friendly way of opening a conversation There are many ways to say. Review Practice spelling your name. I will walk around ask you to fingerspell your name to me. This is worth 10 points. Work with your partners for Alan.